"A time for healing" was how many classified last Friday's dedication of the new Boring Vietnam Veterans Memorial in the Boring Station Trailhead Park at 28008 Keller Road. People from Sandy, Boring, Estacada and all over Clackamas County came to see the newly mounted black-granite memorial and honor the 41 men from Clackamas County who lost their lives in the Vietnam War. The occasion on Friday, Sept. 21, also marked POW/MIA Recognition Day. Dignitaries including Clackamas County Commissioners Paul Savas and Ken Humberston, House District 52 Rep. Jeff Helfrich, House District 39 Rep. Bill Kennemer and Senate District 20 Sen. Alan Olsen attended and a few spoke. "My number was 258 that year," Olsen said speaking of the draft, which took many men into the highly controversial Asia-Pacific conflict. "They only called 195. In the era of this war, our heroes came home not to a heroes' welcome." 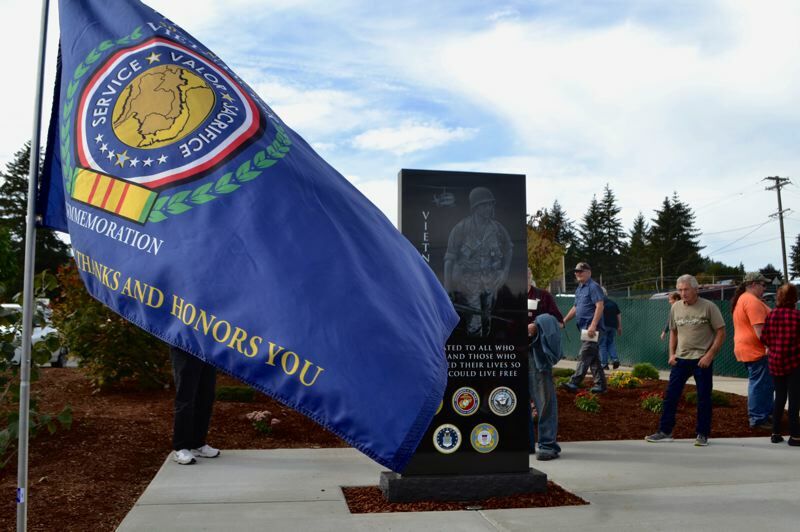 Olsen spoke further on the judgment and disrespect many Vietnam veterans experienced after coming home from the war, and described the creation and dedication of the Boring memorial as a step in the healing process for those who served from Clackamas County. "It will not only serve those of the Vietnam era, but all who have served or sacrificed for this nation," he added. Rep. Kennemer used anecdotes from his work as a psychologist to depict the plight of the veterans he's met, and why the memorial is so deserved. "There are haunting stories from those visits we need to recall," he said. "We need to heal some wounds and recognize those who gave their all." Commissioners Savas and Humberston read the names of all 41 men who died serving from Clackamas County, and Vietnam veterans in attendance who had not been formally thanked for their service received a commemorative pin and letter signed by the president.